AutoServicing�is designed to help automobile service providers to publish their portfolio online and offer servicing details to customers. 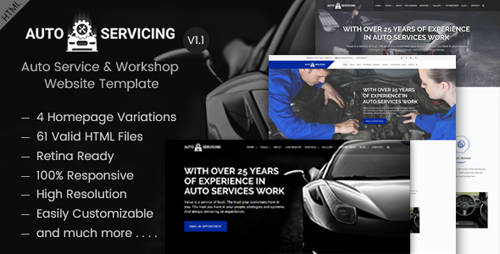 This website template is extraordinary suitable to create website for automotive repair shops, stores with spare parts and accessories for car repairs, car washes, service stations, car showrooms painting, major auto centres and other sites related to cars and car services. Also, the template is a perfect website solution for businesses like garages motels and gas stations, repair of tires and wheels, repairs of brakes and other parts of cars, car rental, car diagnostics, auto glass repair, private car services, auto mechanic, car repair shop, mechanic workshop, car repair services, auto painting, auto detailing, tire or wheel shop, serviceman or skilled worker like panel beater or for any handyman, spray painter, body builder, car dealer, motorcycle mechanic or automotive technician etc.